I recently had the opportunity to try out Moukisac– a reusable shopping bag system made by The Moukisac Shopping Bag Company Inc. Moukisac is a Canadian company and is proud to say that all products are made in Vancouver, British Columbia. I love to support my fellow Canadian entrepreneurs! They make two products- Moukisac and the Moukinet. Moukisac is an eco-friendly shopping bag system that is compact and easy to carry and also includes a versatile small carry bag with 1 full-sized reusable shopping bag and 4 Moukinet drawstring mesh bags. 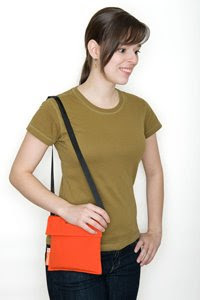 It can be worn as a shoulder bag, sling bag or around the waist. The Moukisac comes in a wide array of colours and fabric (unbleached cotton, water resistant nylon, polyester cotton, etc). 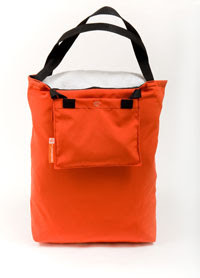 These bags are super easy to care for and clean and are machine washable and dryer safe. 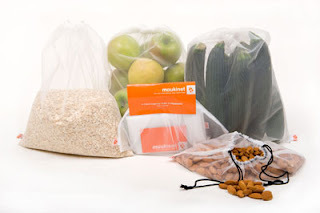 Moukinet mesh bags are eco-friendly produce bags that can be used in combination with your Moukisac or on their own. They come in six different sizes to fit various sizes of fruits and veggies. They can also have other uses including holding bulk grains or pasta, sprouting seeds, grains and beans, protecting delicate clothing in the washer, or holding your yarn for knitting. The Moukisac Reusable Shopping Bag System sells for $34.50 Canadian and the Moukinet mesh bags range in price from $4.00 to $8.00 Canadian. So for all you US based readers out there, this product is even more of a bargain for you with the exchange rate! How can one buy a Moukisac or a Moukinet? There’s a few different ways including order online, by phone, by mail. There a few stores that carry Moukisac in British Columbia and Alberta. For more information, visit their website or call 604-439-7404. I love to be able to do my part to help the environment and Moukisac definitely is a product that is easy to use and leaves no waste. I was given a red Moukisac Reusable Shopping Bag System from Moukisac for my review. I tested it out by going out to my local grocery store to do my weekly shopping trip. I used the Moukinet mesh bags for my produce and I really loved how there was different sizes since some veggies are bigger (and heavier) than others. The Moukisac system was super easy to use too. I wore the Moukisac like a purse and as I needed a bag to put a veggie in, I simply pulled it from the purse and dropped it in. There are drawstrings that I pulled to hold the veggies in there so they wouldn’t fall out. These bags are strong too and held some of the more heavier things like potatoes and onions. I no longer needed to use the plastic produce bags that for me, are so darn hard to open and create so much waste. When I was paying at the cash register, the cashier commented on what a neat idea that was and asked where I got it. I definitely recommend the Moukisac system because its easy to use, practical, safe for our environment and leaves no waste behind. Thank you to Moukisac for giving me this opportunity!